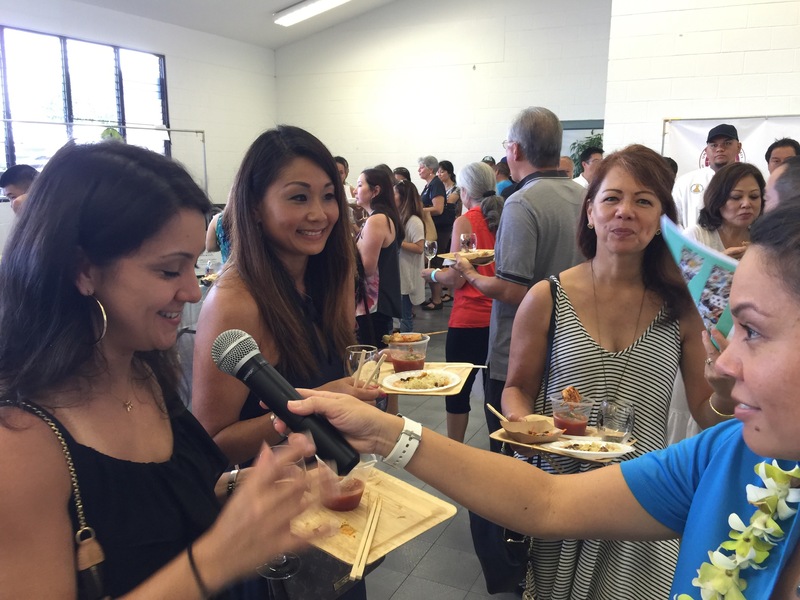 The Japanese Chamber of Commerce & Industry of Hawaii (JCCIH) presented the 17th annual Taste of Hilo on Sunday, October 18 at Hilo Honpa Hongwanji, Sangha Hall. 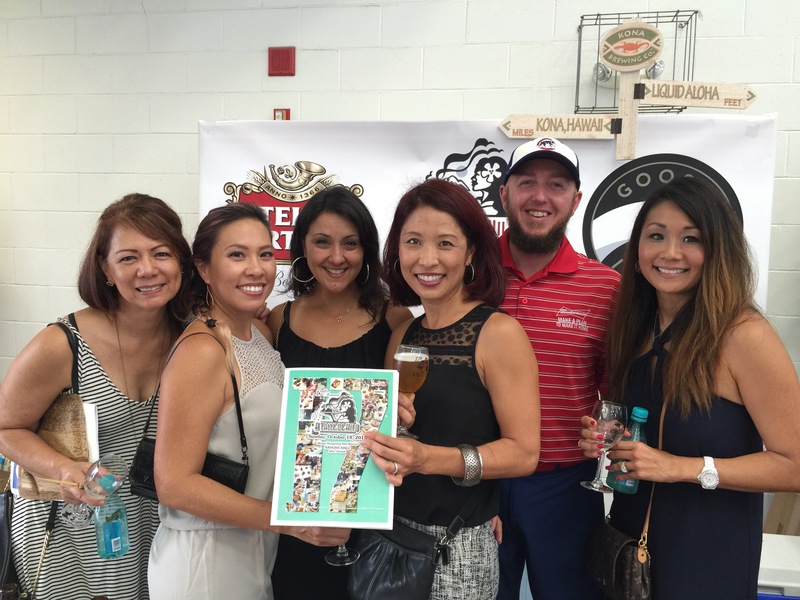 A portion of the proceeds at this event support Hawaii Community College. Through the support by JCCIH, Hawaii Community College is able to provide student scholarships, program and facility improvements, and faculty/staff development activites. Every year, this event features a special ingredient to showcase. This year, the featured ingredient is Kona-grown abalone from Big Island Abalone. The abalone is produced in Keahole and is a premium stock of Ezo abalone, a northern Japanese variety. 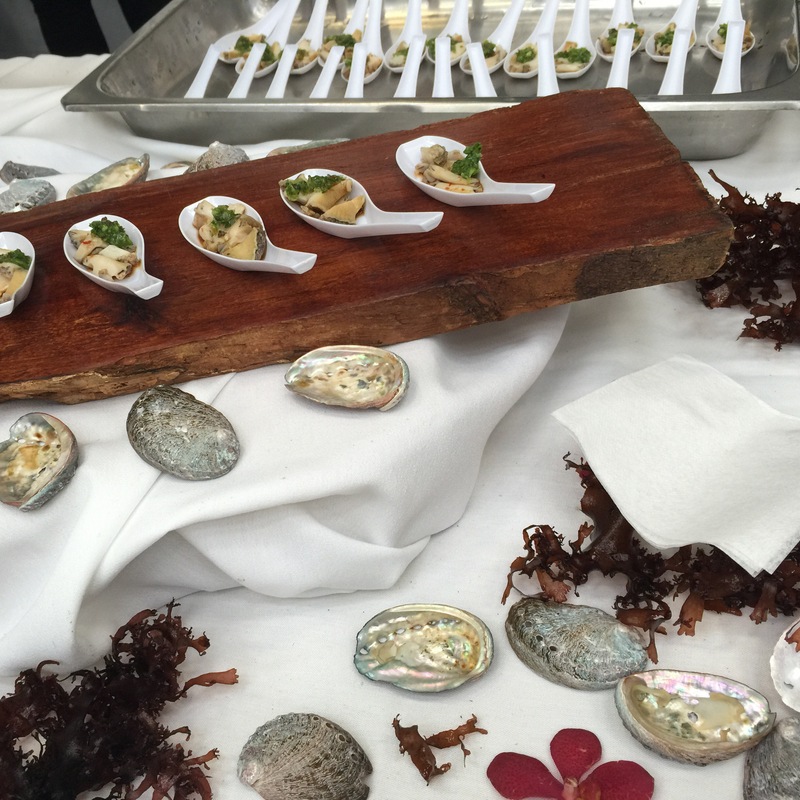 The cost of the abalone was sponsored by Hawaii Gas Company this year. Executive chef Donald Nakamura and Sushi Chef John Iha, both of Sansei Restaurant, gave two different preparations of the abalone to the attendees. One was a plated miso-tomalley butter ogo, tomato relish & meyer lemon air. The other was a spooned Chinese-style Kona abalone carpaccio with ginger cilantro, and green onion with a hot peanut oil sear and seasoned with spicy ponzu and smoked sea salt. Yum. I really enjoyed the Chinese-style preparation in an amuse bouche size serving. The abalone was crunchy and fresh and the seasonings complemented the abalone flavor perfectly. I attended this event with some ever-faithful friends who enjoy food as much as I do. 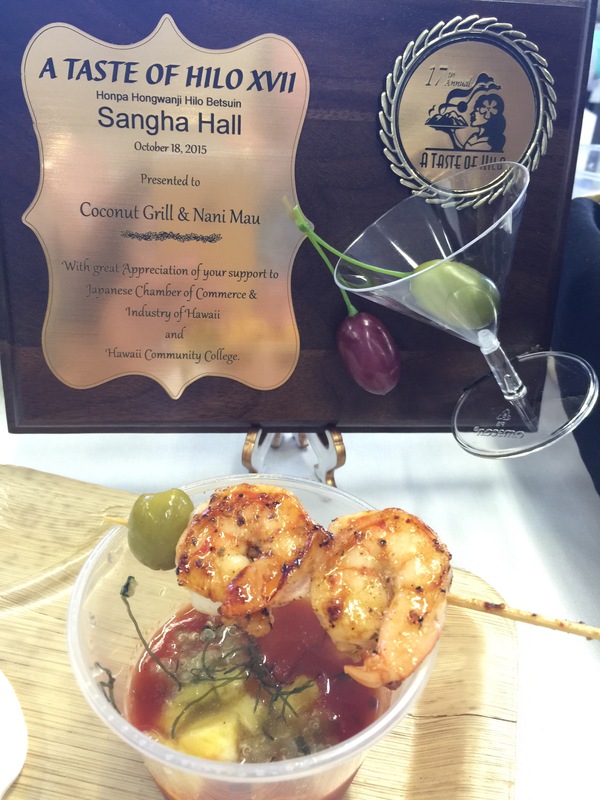 Based on past experience, we expected that it would be warm in Sangha Hall. Today was no exception and we all made sure to wear something cool. Next year, we’ll try to remember to bring fans with us. This midday event was emceed by Gina Tanouye, a member of the JCCIH and chair of the Social and Cultural Committee. Gina, a talented singer with the cover band Vizion 20/20, was the perfect emcee and mingled with the attendees as she walked around the hall throughout the event. There were 35 restaurant, catering, and drink vendors at the event. 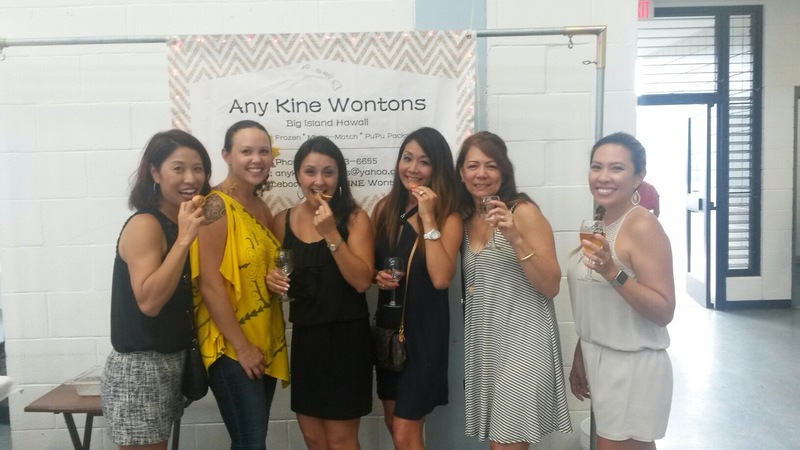 Some of the vendors included Aloha Mondays Catering, Liko Lehua Butter Cafe, Hawaii Community College Culinary Arts, The Feeding Leaf, Paradise Beverages, and Any Kine Won Ton. As we walked around the venue, people were happy and friendly and shared their tho ughts about the different dishes being served. 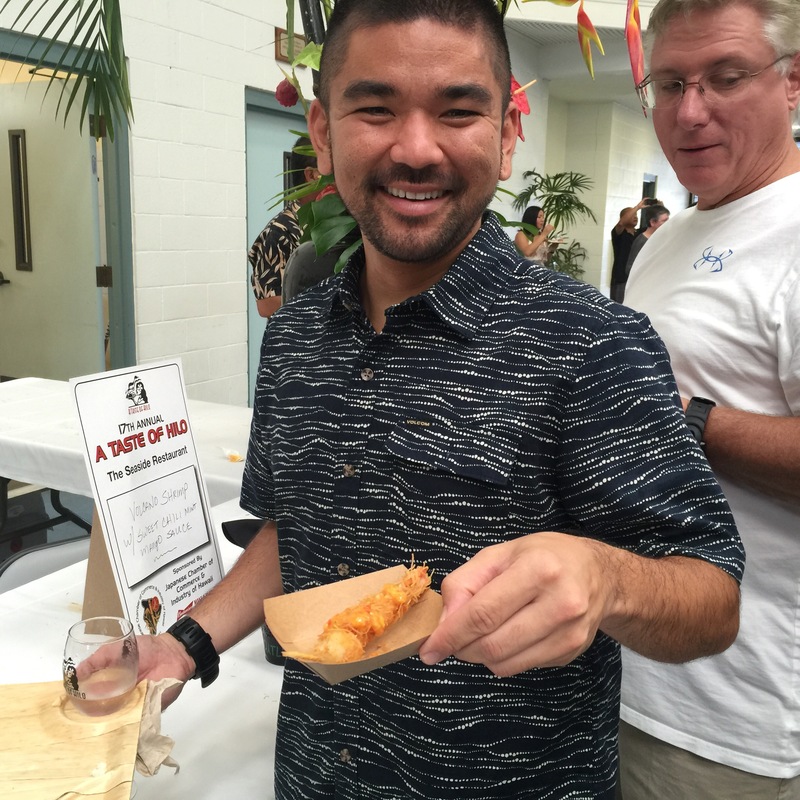 The shrimp from Seaside Restaurant was a big hit as well as the Lava Rock Shrimp on the Rocks from the Hawaii Youth Business Center. 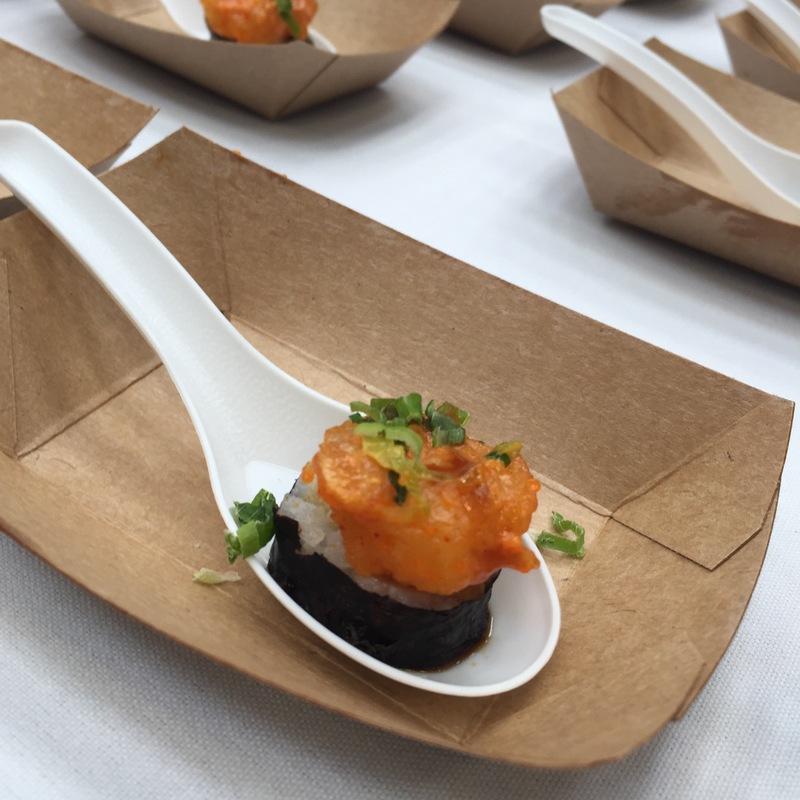 Another special tasting at the event was the plate shared by Miyako town located in the Fukuoka prefecture of Japan. 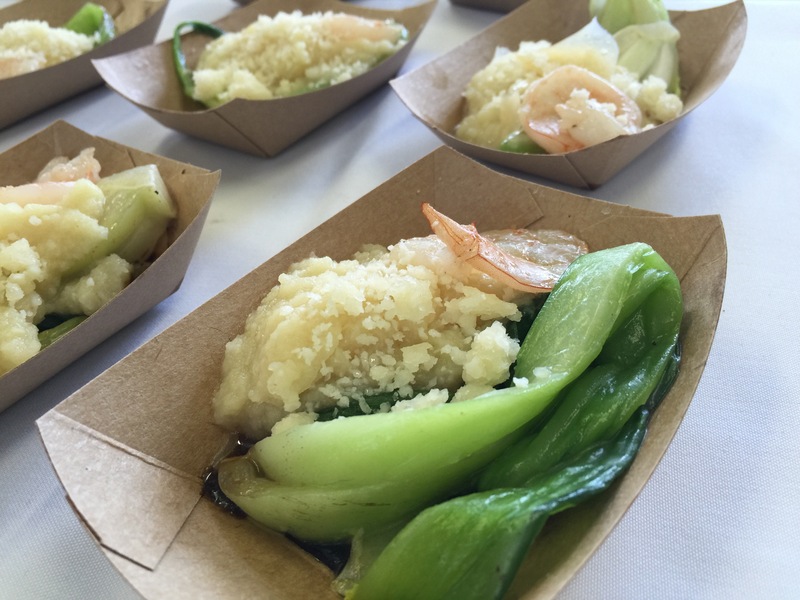 They served yummy pickled vegetables with rice, as well as green tea, and sake from their region. My favorite dish of the event was the one served by the Hawaii Community College Culinary Arts program. 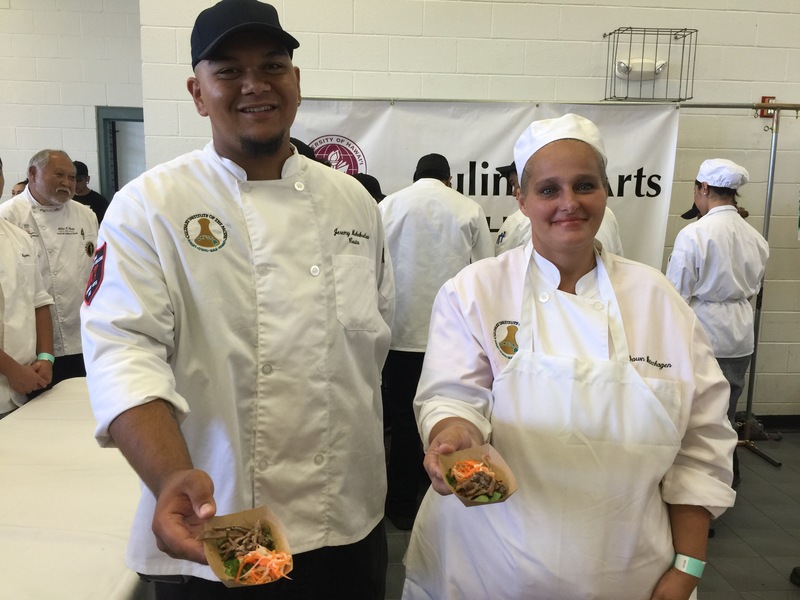 The Hawaii CC culinary arts students served thinly sliced beef marinated in Korean flavors with Vietnamese pickled vegetables to create a cool and refreshing salad that was perfect for the warm environment. 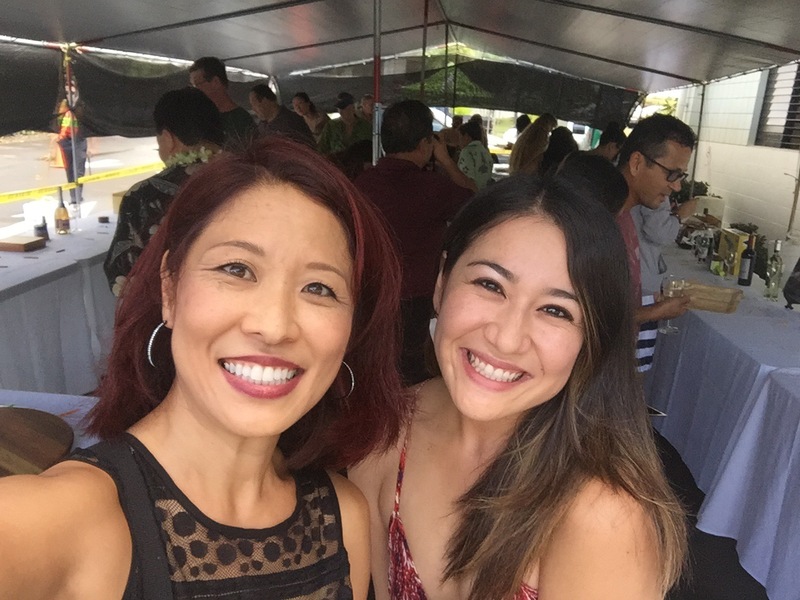 I loved walking a round, mingling with friends (and former students #HiloPeople) and supporting a good cause. This is another example of a Hilo event where Hiloans can do good while living well. Living Hilo Style.